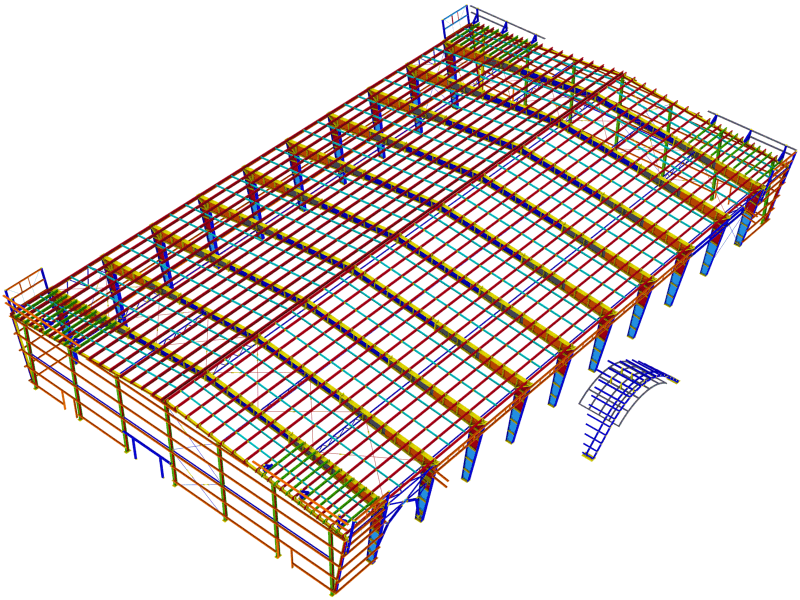 We provide Steel Structures Detailing Design for any kind of steel structures. Evaluation of your Steel Structures Detailing Design projects in accordance with international standards and construction codes and requirenments. 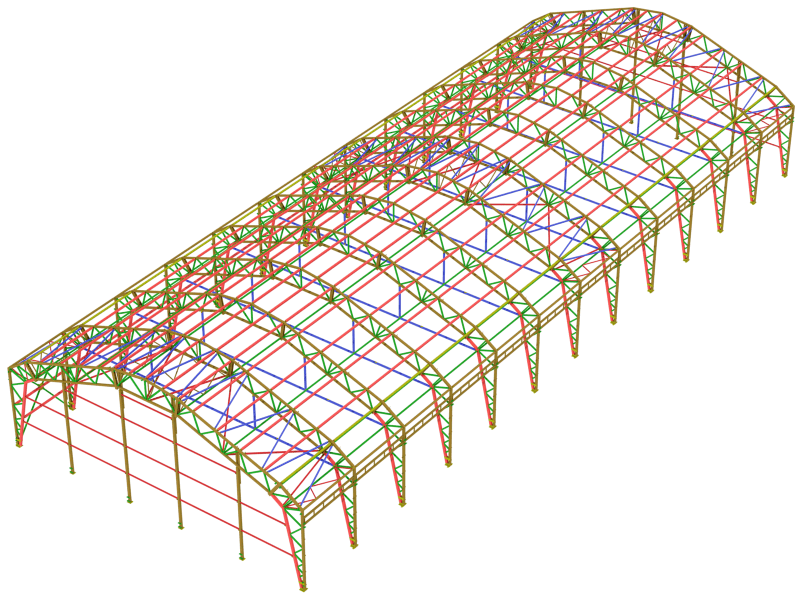 You can buy a Steel Structures Detailing Design Projects from our predefined and professional portfolio. 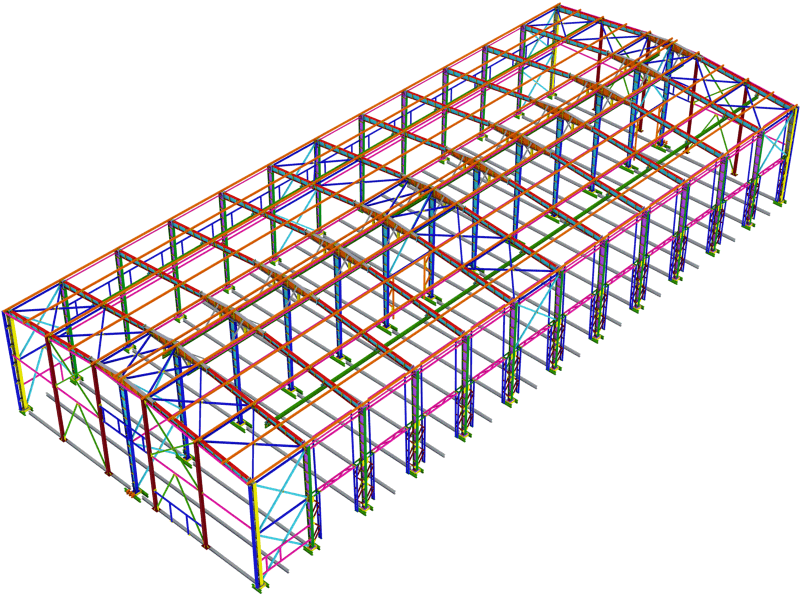 Our structural design and engineering company is one of the Top Leaders on the Steel Structures Detailing market. All of our professionals are highly involved in many diverse projects. Each and every one of our employees has a diverse experience and skill sets. 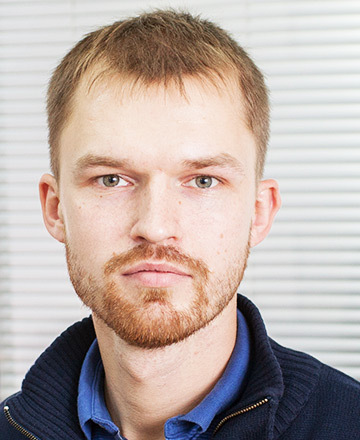 We have more than 40 highly trained specialists. We implement the most modern methods in structural design to produce high quality projects and best customer care. 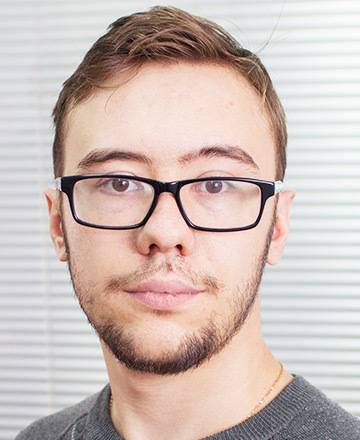 we focus and working very hard on all of them, communicating with a customer to meet the deadlines. We are proud to be a part of more than 300 completed projects. Check out some of them bellow. Project of model building based on welded beams. Such structures are very popular due to their simple design, low metal content and consequently low total cost of the project. This type of construction does not take up much space when transporting. Also it is not difficult in installation of such structures. In this project applicable thin-walled girders to ensure the strength characteristics of the roof with the least weight of metal. As a rule, the roofing on such buildings consists of standard sandwich panels located on the roof slope. This design has a distinctly braced blocks which to begin installation with. Since the blocks are braced on either sides of the building, the installation could be started from the both sides. This type of construction is usually used in model building design and constructions with large span. Project of model building based on welded beams of variable cross section. The project is based on the classical scheme with beams of variable cross section of large span. Clear span is 36 meters. Columns of this structure are made of beams of variable cross section. The project on the basis of such beams has several advantages compared with designs based truss. When slope farm 10% farm out of the square pipe would be 3.6 meters high. This greatly impedes its transportation and will significantly increase the unused space within the premises. Runs are performed on a non-split scheme with overlap of thin-walled Sigma profiles. Pakverk contains horizontal guides vertical sandwich panels with additional structural members for window and door openings. This type of construction is characterized by extremely diverse structure of metal. Different equipment leads to a variety of load locations on bearing structures and to a large variety of used steel structures. 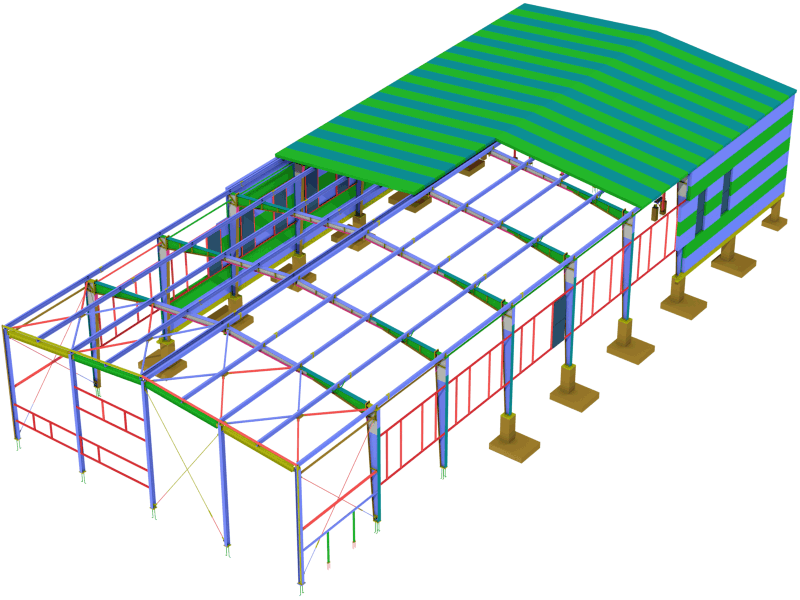 A wide range of sizes of beams leads to an increase in the number of drawings Structural Steel Detailing. This design includes about 30 pages of KM drawings and at least 2000 pages of Structural Steel Detailing drawings. Also in this project additionally marks were labelled. Structural steel detailing drawings for this project have been developed during 3 weeks. Ice rink (2 hokey boxes). Project of sports facilities indoor ice rink, two hockey rinks. The project is designed by our experts on the basis of two span beams with variable cross section. The project is an example of designing sports facilities of small volume. Wall panels are stacked on a vertical scheme, so horizontal guides were added . The roof is made of sandwich panels which were laid along the line of slope water. The whole project was made by 4 engineers during 3 weeks from the start until the delivery of the project into production. Typical project of technological overpass. The project is a typical technological overpass. This type of steel structures is typical in the design of factories and other production facilities. This type of construction became widespread in the oil and gas industry. It is characterized by extremely diverse structure of metal constructions. A wide range of beam sizes leads to an increase in the number of Structural Steel Detailing drawings. Project of standardized building on the basis of truss of the coupled area. At first have been developed the general concept of the building and set of architectural decisions. After approval of the architectural part of the project we made the calculation and 3D model building. At the next stage are executed set of KM drawings - metal construction. 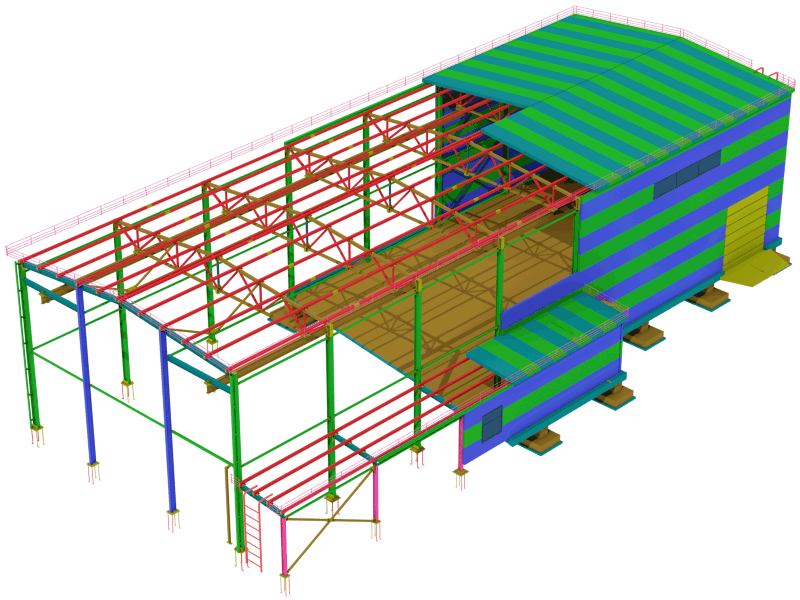 After an expertise we developed set of Structural Steel Detailing drawings - structural steel detailings. Set of Structural Steel Detailing drawings are needed for fabrication by the plant manufacturer of metal structures. The developing of all documentation took us 30 days. The whole construction was developed using modern software products. Designing in 3D can significantly improve the quality of project documentation and reduce the project development time. Project of typical agricultural building. This project is an example of the typical general-purpose room. This type of units is widespread in the agricultural sector. The whole project was made by 2 engineers during 5 days from the start until the delivery of the project into production. This type of structures provides accommodation of crane tracks for mixing mobile crane. The project involves the horizontal placement of sandwich panels for truss, as well as the sandwich panel for the roof along the slope. The span of construction can be up to 60 meters. The project consists of a technical room for accommodation large-sized military items.The technology of erection of these building implies no conditions for welding works. 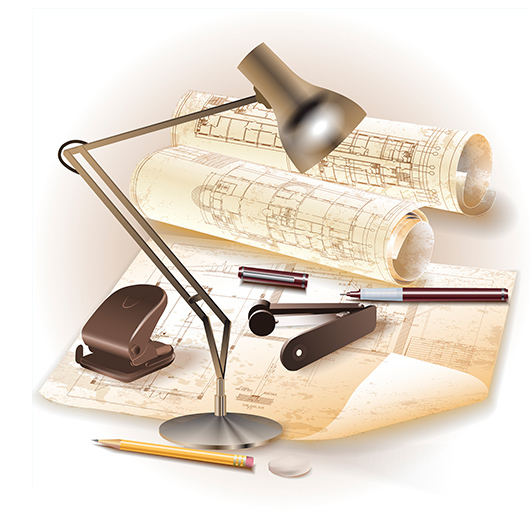 Development of construction documents was carried out in the General design format which means development of all sets of construction documents. The whole project was made by 8 engineers. Full cycle of documentation development took us 3 weeks. Roof structure consists of a truss from pipes of square section. This type of construction is one of the most common type in Russian Federation. This type of construction is characterized by minimum metal content. 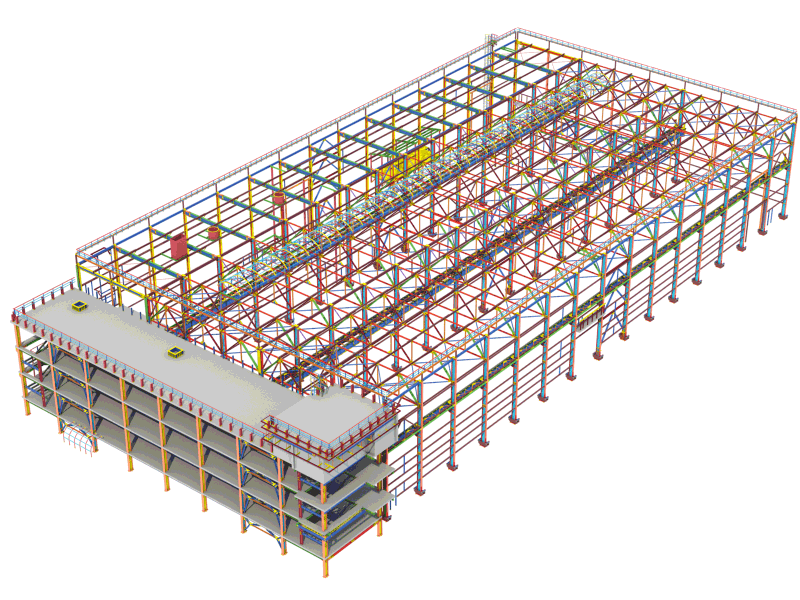 Structural Steel Detailing drawings for this project were developed during 3 weeks. Evaluation process may take anywhere from 5 minutes up to 1 hour depending on complexity of the project. We'll send you an offer with price of your project and required time frame. Next we'll negotiate contract terms. Usually, we use standard design contract. The start of a project is the same date as the first payment. The 3-D model is being developed and being discussed with the customer. After that design drawings are to be published. Corrections or additional requirements are to be discussed in written form. Any significant amendments are to be discussed with manager in order to clarify whether it requires additional time to finish design project. 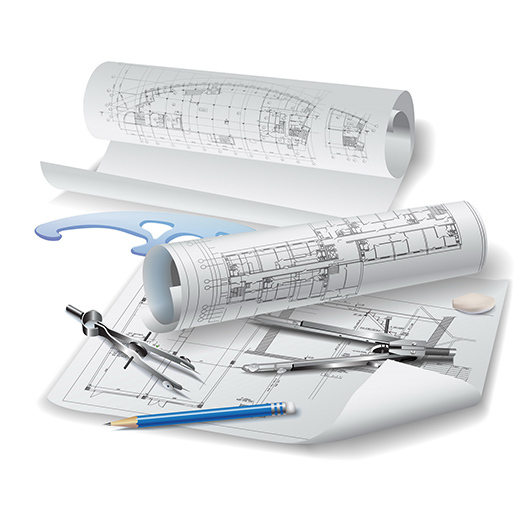 When finishing the project, we provide to a customer full set of design documentation except installation drawings. Therefore, a customer is provided with the drawing to start manufacturing steel structures. Assembly drawings are provided after the full payment. You will have your personal manager throughout the entire project. He will perform his best to lead your project and consult you with any question you may have. What is steel structures detailing? Steel structures detailing is an essential part of steel structures design. Manufacturing of steel parts (details) is being fullfilled in accordance with detailing drawings. Bills of materials show the amount of steel being consumed for this particular structure. Steel structures detailing includes installation drawings to indicate the exact position of each part (detail) ot the installation stage. This includes general information about the project, seals and signs. The installation process is being held in accordance with these drawings. These drawings shows the main structural joints. This is a set of drawings of each part with all the dimensions to produce it. These drawings display how to weld detail pieces to each other. The list and number of bolts to be applied in a structure. List of materials required for manufacturing. The list and the number of marks. Cover sheet is the first list of any project. 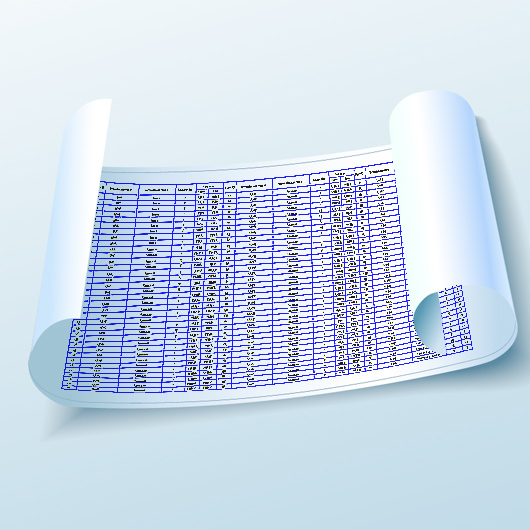 This sheet is to be arranged to meet all client's requirements. 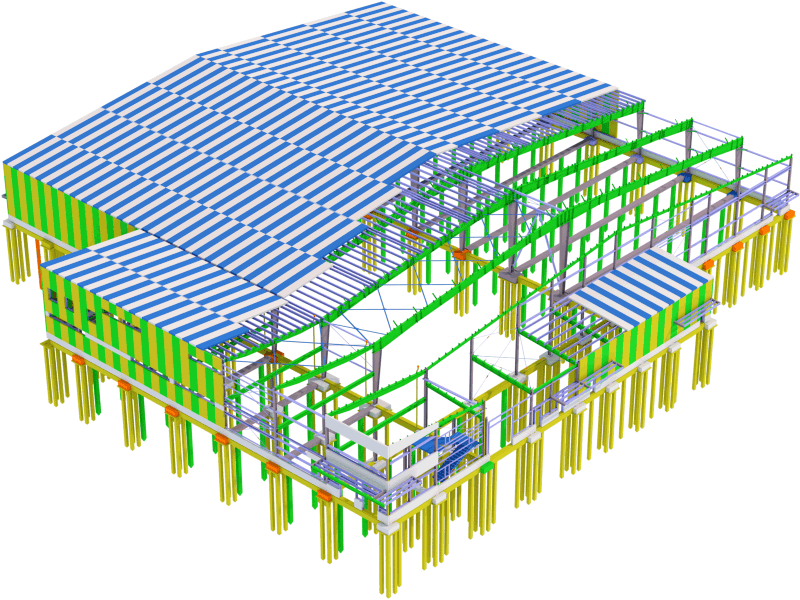 The cover sheet is a mandatory part of the project Structural Steel Detailing. This sheet is the first sheet of the project and it is made according to customer's requirements. 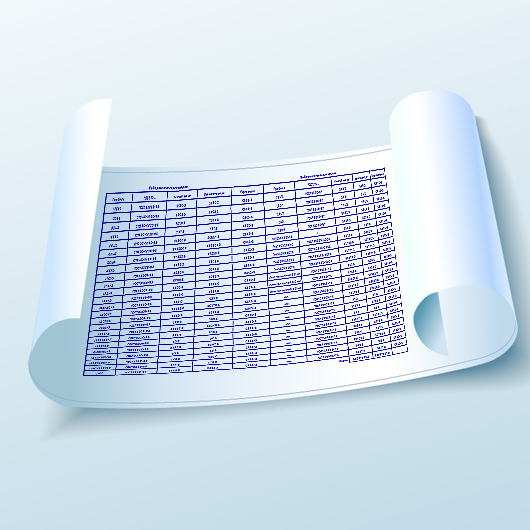 This bill shows the full list of materials needed to manufacture steel structures. 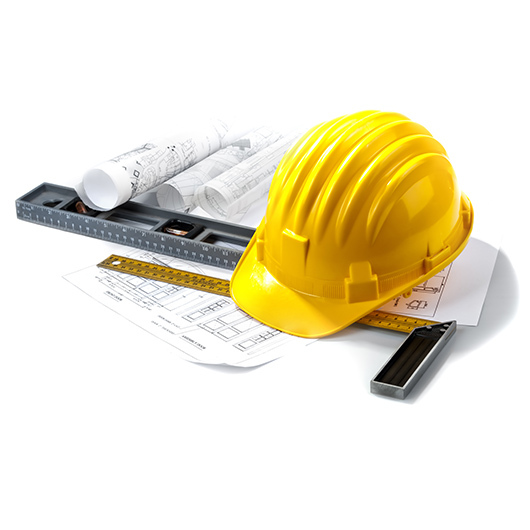 This bill is the basis to evaluate the price of a structure and further material purchasing. Needless to say, the material loss for cutting is not considered in this bill. This can be considered in steel cutting sheet. Usually, the loss for cutting and surfacing is 1 % and 3 % from the total mass respectively. This sheet includes all the marks (assemblies) of a structure. Each assembly is marked in accordance with shipping list. Then each shipment from a workshop is being weighted and compared with shipment list. Installation drawings consists of plans and sections with marks of assemblies. The installation process is based on these drawings. There are a several types of structures shown on drawings so each type is placed on separate drawing. For example: bearing structures, coverings. Also, installation drawings may display typical joints. These are the drawings needed to manufacture parts of a structure. Therefore each drawing consists of one part with all dimensions and other properties. It is necessary to place an unique mark on each part so it is easy to trace how this part is being produced at workshop. Also, single-part drawings depict how many parts with this mark are needed and which assemblies include them. 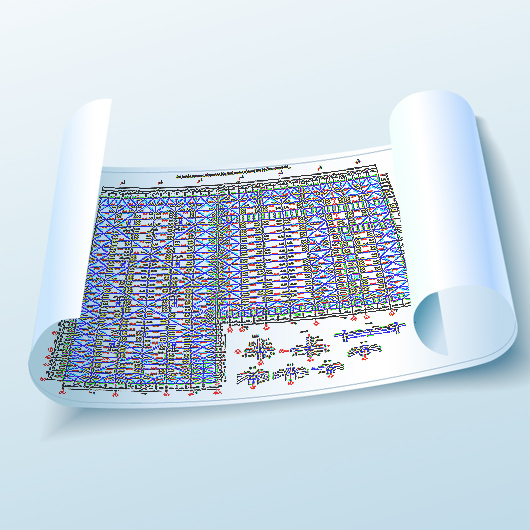 This set of drawings may take up to 90-95% of each steel-structures detailing project. The drawing show dimensions and general size of each assembly. Usually, these drawings show the placement of each part respectively to each other. 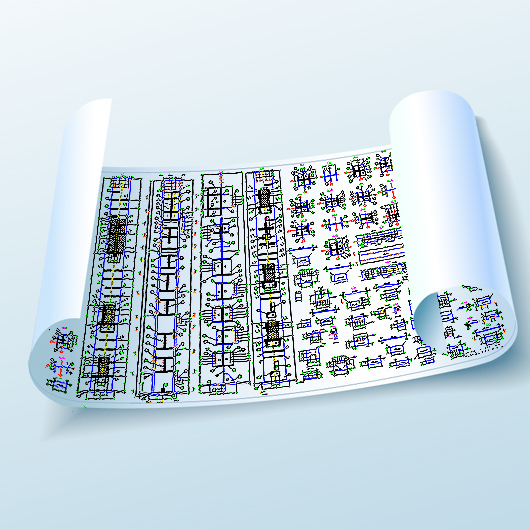 Sometimes single-part drawings are added into assembly drawings. So each assembly drawing includes the drawings of each part of an assembly. These drawings includes bills with marks of each detail and marks of assemblies. We use the most recent methods in structural design. One of our main purposes is control and automation at structural design which leads to decrease risks based on human factor. This helps to decrease expenses and amount of time spent on structural design. The amount of time for each steel-structures detailing design project is individual for each project. Several factors such as complexity, project scale and others are to be considered in order to estimate the amount of time needed for each project. Also the initial data is an important factor to estimate the amount of time needed to develop structural detailing design. Usually it takes up to half an hour to process the initial data and estimate timing for a project. The exact timing is to be sent with a with a commercial offer. If a project is formed with several buildings and needs stepwise submission, then a schedule chart is to be added to a commercial offer. Usually, the calculation of joints in steel structure is needed to develop steel structures detailing design. This is based on the initial data (steel structures basic design) and how deeply it is elaborated. Therefore a contract is applied with additional requirements on design documentation. Detailed study of the calculation of all the project components can greatly increase the complexity of the final project and thus increase the time and cost of designing. 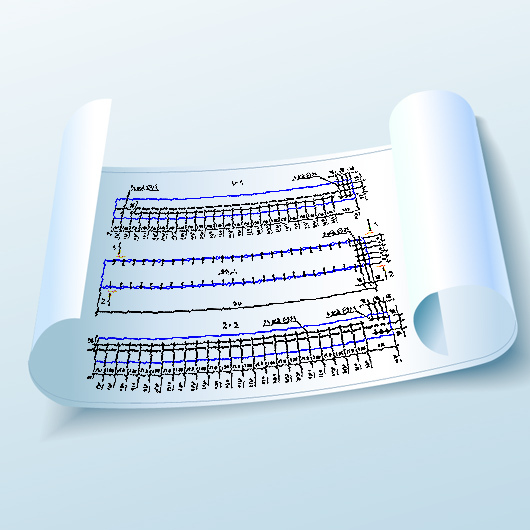 The result of joint calculation is to be presented in a form of a calculation note. In order to calculate joints in steel structures, the actual loads acting on each element are needed. Therefore, if the actual loads cannot be lighted in the steel structures basic design, it also can be developed beforehand. While working on steel-structures detailing design project, a client can apply additional requirements on final project. Sometimes, these are the requirements to replace one beam profile with another or to replace hot rolled section with welded section. Therefore, it may affect the specifics of joints. This leads to modification of the model. These modifications are to be discussed with the head engineer and the final solution is to be accepted. reinforced concrete structures, and architectural design. 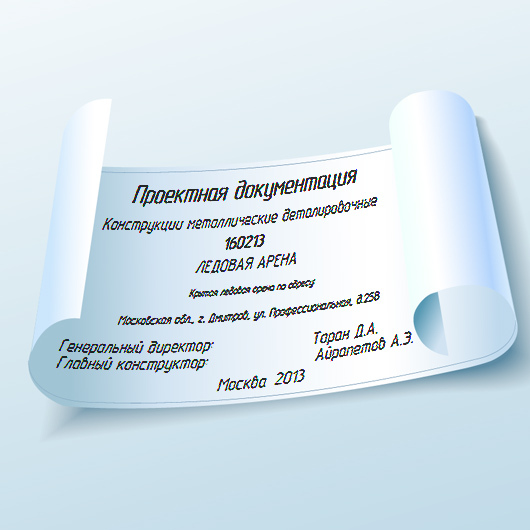 We are using certified Tekla Structures under official licensed agreement. The price evaluation for each project is individual; however the typical range of prices can be established. 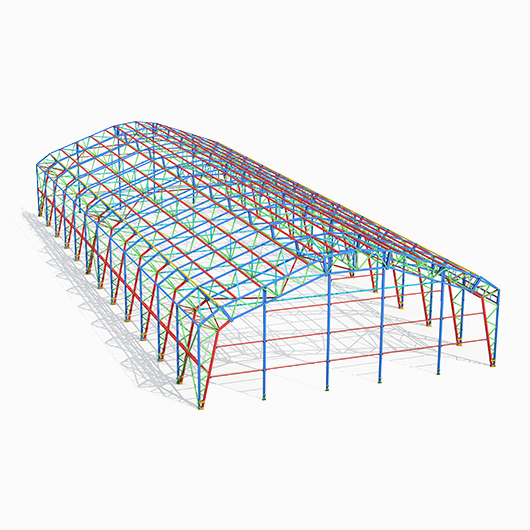 The price for steel structures detailing design is shown for 1 ton of steel structures. on the basis of truss. The payment is being held as a cashless payment. The form and the amount of each payment is discussed by both sides beforehand. The actual start date is the same as the date of the first payment. 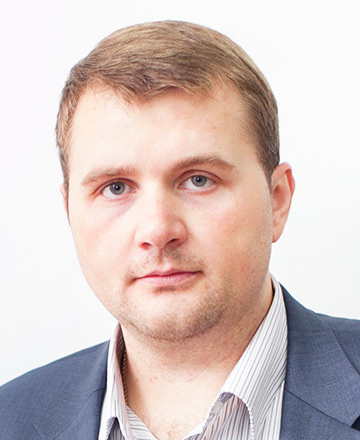 The first payment takes 30% of the whole sum of contract. The further payments are being conducted in accordance with terms of contract which is discussed by the representative of our company and a client. 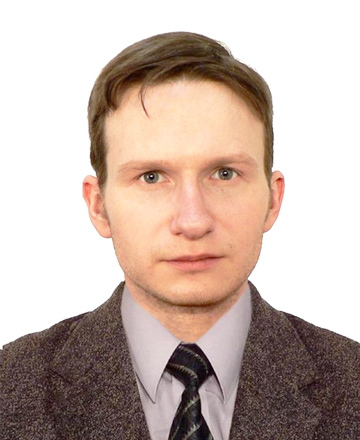 The payment can be carried out in Rubles or in any foreign currency by the current Central Bank course. We have a set of hundreds of standard projects. Such as warehouses, logistics and industrial facilities and all of them have been already used in real life. Purchase of a standard project, could be completed in 1 working day! which are very experienced and very professional. 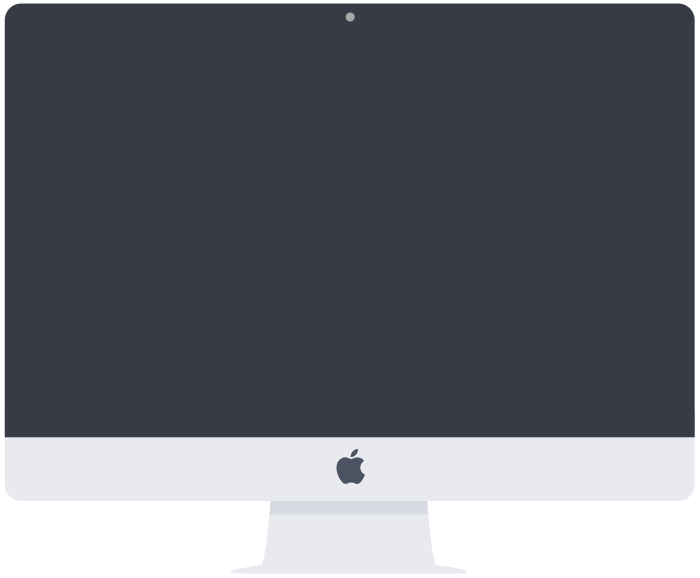 This allows processing all the application in a short time. All specialists of our company are qualified and highly trained. Helping customers to prepare the initial data and project requirements. Also arranging work on your project and consider all the details. Developing and discussing with a customer the work schedule for steel-structure detailing project. 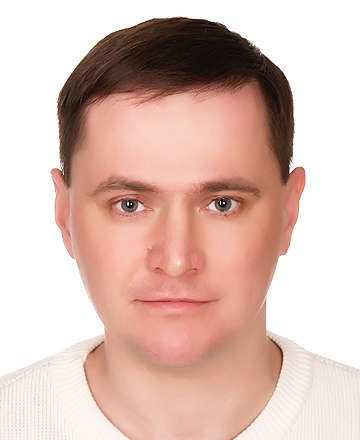 I will answer all your technical questions and personally supervise the quality of work. 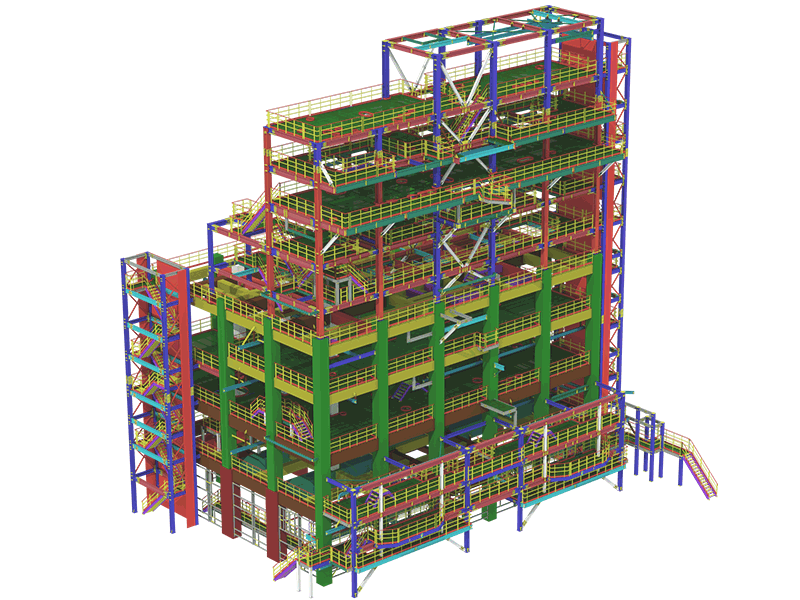 Our engineers are qualified an trained to perform structural design of any complexity and meet any requirement of a client. My direct aim is to provide the quality of design project. It is my responsibility to control the compliance of each project with the design codes. Supervising the project untill it is submitted and final. I'm also responsible to discuss all the issues related to modifications in the project as well as meeting client’s requirements. 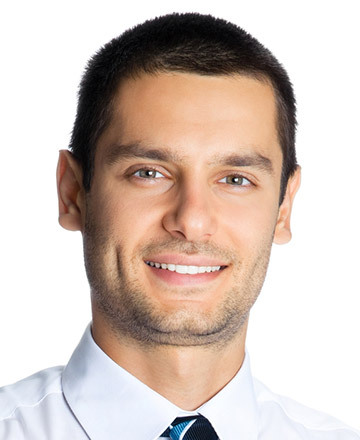 I will answer your questions about cost of structural design for you project. Is this enough to apply on-line or should I also call on you contact number? An on-line application is enough, if you have put your contact details. However, if you need the information about your project in short-time, I would recommend you to give us a call. Should I send you the whole steel structures basic design project or is it enough to send just part of it? 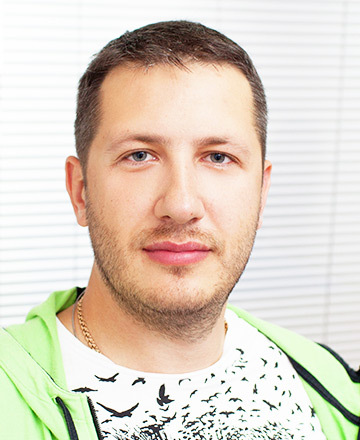 Usually, the whole basic design project is needed in order to evaluate the price and the timing. How many payments the whole sum can be divided into? It depends on the scale of the project. Can your company start working on the project without the first payment? Unfortunately not, the start date of working on the project is the day of the first payment.